Mote Beach Tea is a combination of fruits and herbs including coconut, apple, hibiscus, rosehips and pineapple. Mote Beach Tea contains no sugar and is naturally caffeine free. Mote Beach Tea was created to honor of the marine research conducted at Mote Marine Laboratory. 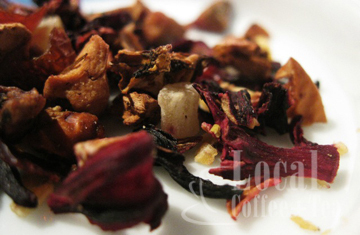 This beach inspired loose leaf tea is a tisane and contains no true tea, camellia sinensis. Mote Beach Tea is high in vitamins, minerals and antioxidants. Wonderful hot as a calming bedtime drink, or iced as a popsicle in the summer. Mote Beach Tea is available in distinctive blue bags that are re-sealable to maintain freshness. On the back of each package is an overview of Mote Marine Laboratory. I’m not a particular fan of sour teas, I like a little bit of tartness to a fruit tea or tisane such as this one, but when it is really tart, it is a little off-putting. This tisane is almost too much tart. Almost. That being said, this tea isn’t ONLY tart… there are some other delicious things to be said about this tisane as well. In particular, I am really enjoying the combination of the pineapple and coconut. It lends a lovely tropical flavor to this blend. The tartness comes from hibiscus, which also offers a bit of thickness to the liquor, giving it a rather enjoyable texture. The apple also brings a little bit of tartness to the party, but I am also noticing a backdrop of apple-y sweetness. Nice! As I continue to sip this tea, I find that I like it better. It is especially nice when it cools down, because it tames some of the tartness. The coconut is sweet and smooth, and I am really finding it to be particularly delicious here. It is a bit like a tropical nectar! A couple of things to note about this blend: 1) I added a dollop of honey to the brewed tisane and found that this brought the tartness level down to a palatable level for me. Like I said, I’m not big on tart. BUT, if you like tart/sour teas, you should taste this one before sweetening it. 2) If you want to tame the tartness without having to add a lot of sweetener, try steeping it for only 5 – 6 minutes instead of the suggested 8 – 10 minutes. This should be long enough to extract the flavors from the ingredients.